GunsOfNavarone and E55 like this. 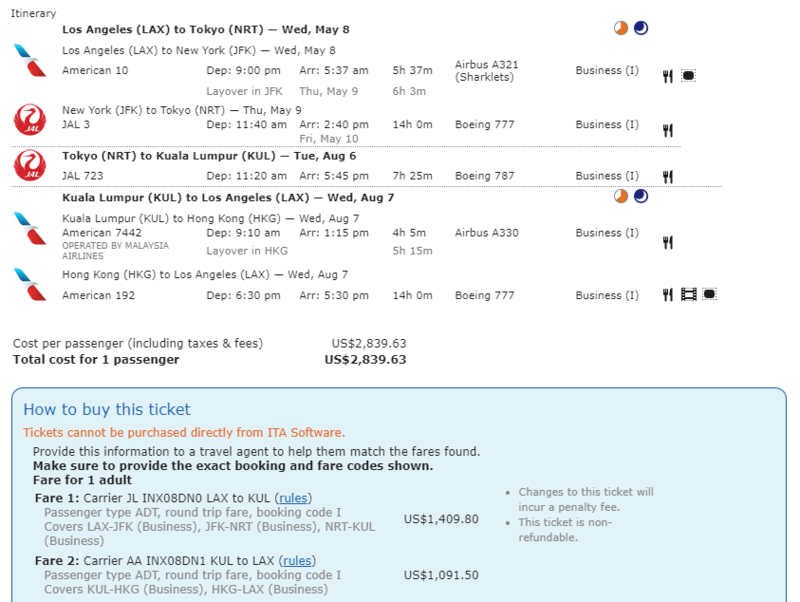 One stopover (TYO) seems to add at least a whopping $600 and up for me, but admittedly I tried it just on google flights and the aa sites. I tried the stopover too and it looks like HIP kicks in. Were you able to get KUL-HKG on CX? I'm afraid of MH. Having flown this leg many times I can say that CX has better wines than MH while MH has better seats and better food in comparison to CX. Planes and pilots are comparable. I've also flown KULHKG several times. With OWE, you have access to the first class check in at KUL on MH (now rebranded Business Suites check in). Not with KA. There is no official fast track policy at KUL for OWE, but in J you will be entitled to use the faster business/first immigration line. With your J ticket, you can use both the MH and KA lounges at KUL due to OW policy. In my experience, MH usually departs from a main terminal gate - so it's less convenient to use the larger lounges in the satellite terminal. KA usually departs from the satellite terminal. Seat wise, MH A330 will have flat beds. The 737 is only recliner, however. Please check schedules for which aircraft. KA usually has recliner seats for intra-Asia J. Food wise, MH will have the satay service, which some people like. KA has better food, in my opinion, particularly chinese options. KA has significantly better entertainment choices than MH. On landing at HKG, KA will usually land at a much closer gate to immigration. MH always lands at the outermost terminal building (cheapest landing slots, where budget airlines usually park), and is a longer bus and train ride to immigration. Overall, both are decent products for a regional flight around 4 hrs, I'd say KA has the edge in general, but take the A330 flatbed option on MH if you can. Au contraire, mon frere...I have confirmed flights including HKG-KUL on KA both ways. (I understand that's not technically CX, but KA does have several nonstops between the cities. Not sure mainline CX has any.) Fare is just a shade above $USD2600. Also was able to use SWUs on LAX-HKG segments for a comfort bonus. Booked dates in December. Will probably head back to SIN for its dining pleasures. All the HND-BKK flights have full lie flat though. All times are GMT -6. The time now is 9:07 pm.